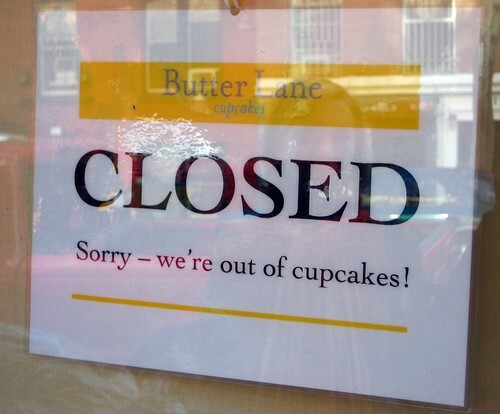 Yesterday, after a delicious brunch with Brownie and Lawman, the Dewey Decimator, a friend of hers, and I decided to head to Butter Lane for cuppycakes only to find the saddest sign ever. Out of cupcakes! That makes me sad. Oh well, off to Momofuku Milk Bar. 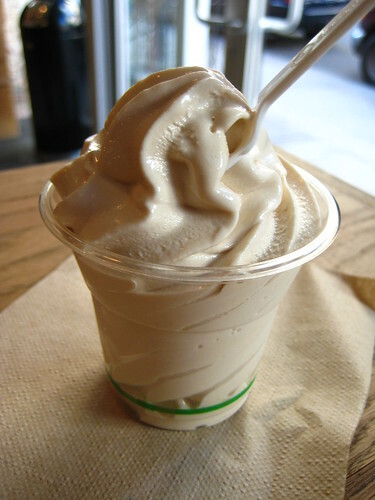 We heard last week that Momofuku Milk Bar had rotated their soft serve flavors again; they are now offering cereal milk flavors. Yes, no more graham cracker, Brownie. From what I understand, Christina Tosi makes cereal milk from toasting a cereal, steeping it in milk, straining it, and then playing around with the remaining milk. She's now transformed this into soft serve ice cream. and her friend chose the third option, Fruity Pebbles. 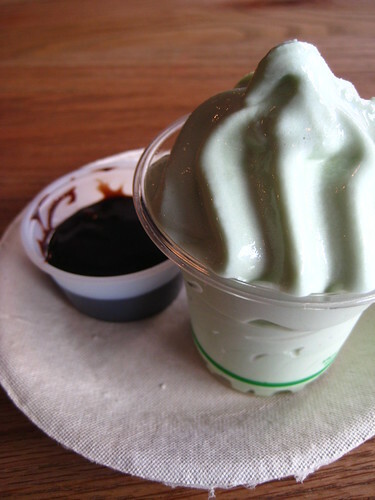 I will say that this is some of the creamiest soft serve I've ever had. We enjoyed it, the main consensus being that each flavor tasted like the cereal it represented. It's sweet, but not cloying. 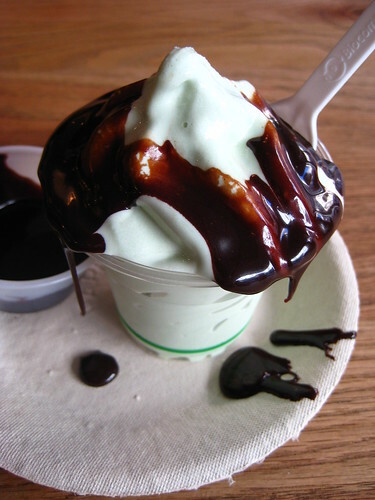 I did find my hot fudge to be a little too runny for me. I like it thick! It's some pretty tasty ice cream, and the price is right in-line with other high-end ice creams in the city, like Van Leeuwen. :( I am oh so jealous of you and your friends. I would die to have something like this around me. Looks like I'll have to start selling it myself. California has nothing on NY's character. Oh man I tried to go to Butter Lane last night and saw the same sign! I had walked all the way from the R train, but I really wanted a cupcake, so I decided to walk all the way to Sugar Sweet Sunshine. So I got a delicious pistachio cupcake, and walked off it's equivalent calories, so I guess I can't complain. 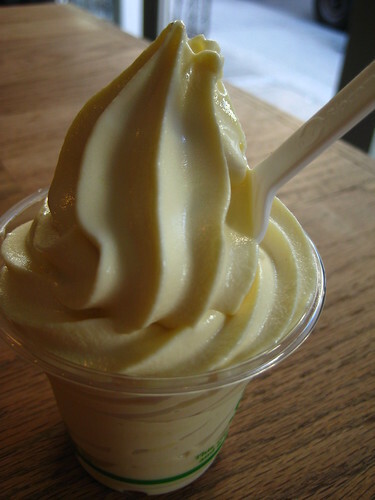 The soft serve looks yummy though! Yum, those look lovely. I want to try the cap'n crunch and cereal milk flavors sooo bad! @ Downtown Luncher: Each of us actually only ate our own. I know, I fail as a food blogger person. I loved the Cap'n Crunch! I went to Butter Lane a couple of weekends ago. It is so cute. And I love the French music on their website. I can't believe it runs out of cupcakes and closes down! Can anyone suggest a good time to get to Butter Lane when they will definitely have cupcakes? I think Butter Lane was just closed due to it being President's Day. I'm sure if you went during the day, they would definitely have cupcakes. Brownie and I have been LATE in the evening (9ish) and they still had dome. Thanks Blondie! We're staying within walking distance and as soon as I've dumped the suitcases on Wednesday I'll be on the hunt for cupcakes!